I’m becoming a bit of a GSCA veteran. My first was New Jersey in 2008, where IMAX launched their new digital system to mixed reviews in front of this tough audience, who have been brought up on and immersed in 15/70 film capture and presentation. IMAX’s new digital system has served them very well though for many years, and it still does; over 800 digital theaters worldwide (across giant screen and cinema) is quite an estate to have developed. This 2014 conference marks a change, however. Digital is with us, finding its way into the capture process (cameras) with varying degrees of success and in giant screen theaters too (flat screens wider than 70’/21m and domes larger than 60’/18m). And already the next stage is upon us; laser-illuminated projectors, higher frame rates, maybe much higher frame rates and even better digital cameras will drive the quality of the immersive experience up to and probably beyond that of our old friend, 15/70. Those of you who read my review of ECSITE this year may remember I adopted and adapted the approach of Pecha Kucha (the art of the concise presentations; 20 topics, each that can be read in 20 seconds, or less, if you’re quick). Where better to start than with a session entitled “Giant Screen Wow Moments and Storytelling”? And it didn’t disappoint. Led by director Daniel Ferguson (who incidentally picked up a two well-deserved awards – best short film and best cinematography, for his very popular film Jerusalem), the panel of Greg MacGillivray, Stephen Low, and Toni Myers talked about and immersed us in their own favourite wow moments. And they were. Wow! Images of skydiving, helicopter fly-pasts of slow-moving trains, our beautiful Earth from space, beavers and Mick Jagger are all now burnt into my visual memory. Stunning, big, bright, clear images. I was immersed. And also by the stories behind the stories (it turns out that Mick Jagger likes beavers, apparently!). It reminded us of just how much work goes into the perfect shot. Days, weeks and even months of preparation to get that one moment. It just proves that these directors are not only skillful but they are absolute perfectionists too. This is the name of the film format that has 15 perforations and a 70mm frame size. It’s big! This “bigness” is what provides the optical resolution to project onto these giant screens in the utmost clarity. That’s why all members of the A-team above presented their wow moments in this format. It has its challenges though. It’s heavy, cumbersome and not particularly practical. Digital capture and projection overcome all these issues. Also, 15/70 typically only plays at low frame rates: 24 frames per second (fps). Which is pretty slow in this fast- moving world. On large screens in particular, this gives rise to image judder when panning across a scene or flying across the continents, which, to those of us fed on digital, can be quite disconcerting. In the 1980’s, award-winning cinematographer Douglas Trumbull experimented and presented a new film format for high frame rate called Showscan. He successfully proved that by running images at 60fps, the results were clearer and in turn more immersive. Well, wadda-ya- know, Doug is at it again. But now with digital technologies he is able to run images at 120fps. And to prove it, he joined us at the conference to share his short film UFOTOG (UFO photography). It was a real privilege to have such a successful special effects legend among us (2001: A Space Odyssey, Blade Runner, Close Encounters, Star Trek: The Motion Picture). UFOTOG opened our eyes to what is possible with the new MAGI process that he has developed for super-high-frame-rate capture and processing. He also showed a short piece called Construct, which was an entirely computer generated, but amazingly lifelike, piece featuring robotic soldiers. Wow and wow! This is the future, probably. 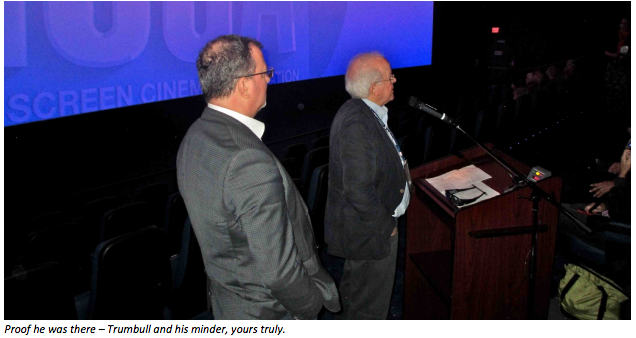 It was good to hear IMAX being so open, more open even, about their technologies and activities. I imagine that this is partly driven by the increasingly competitive landscape. They are no longer alone in serving this market. A large number of theaters (dome and flat) have converted to digital using a wide range of solutions. Some have been budget focused, some prefer to create their own brands and have more independence. The results vary but all claim success to some degree. 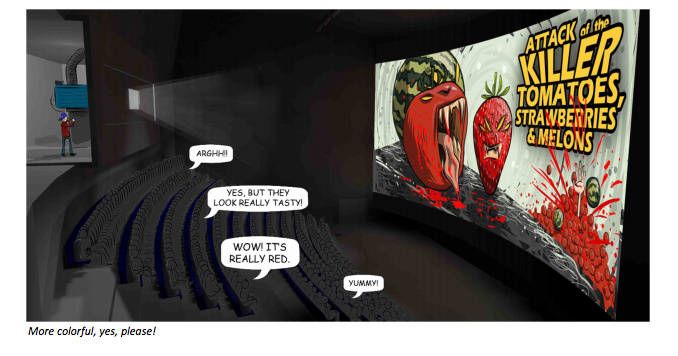 IMAX have yet to show their new laser projector to a public audience, and yet they have already managed to secure agreements for 68 IMAX® GT and IMAX® Dome systems. than to project laser beams into the audience, are safe. Unless your lasers are “brighter than the sun” (his quote, I recall) then it’s relatively straightforward to gain licencing approval in your theater. Which is great news. 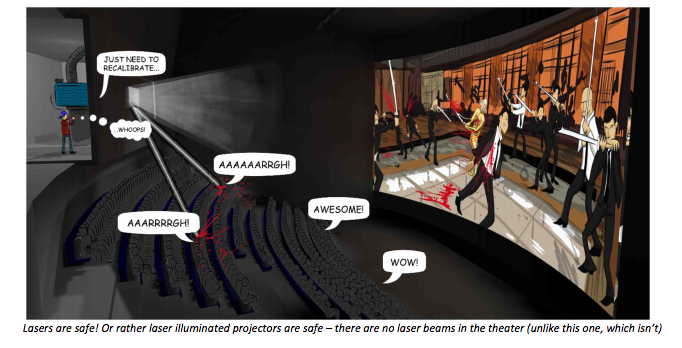 Couple that with the ramp up of orders for laser modules, and we should expect to see a significant number of laser-illuminated projectors in theaters next year, and even a few this year. My own estimate from the data I’ve seen and heard is around 100 projectors by mid-2015 and up to 400 by the end of 2015 (cinema and giant screen combined, mostly to cinema). And a massive thanks to Christie for providing their stunning laser projection system for the Technical Session and final day of film screenings. Using dual 4k resolution projector heads and their remote laser modules connected by a surprisingly thin fibre-optic cable, they were able to show an intensely bright image on the 66’7” wide screen. A few points to note: Because laser-illuminated projectors are far more efficient than the traditional xenon lamp versions (xenons waste a lot of light energy as they have to filter out the unwanted light frequencies; lasers only emit the light frequencies that the projector needs), the same projector head can pass through far more light. So these projectors are bright. Around 70,000 lumens each. That means they can use a nice uniform white screen (of unity gain,—a big thank you also to Harkness for providing the screen for this event) rather than the typical high-gain silver screen which results in a central hotspot and dark corners. The result, a nice bright white and very uniform image. 14fL (foot lamberts) of white, in fact. Even more impressive was that they could also achieve 14fL in 3D on this massive screen (around three times brighter 3D than a typical multiplex with a much smaller screen). This was made possible by a technique called 6P, which uses groups of very narrow color frequencies for red, green and blue for each eye (a total of six primary colors -hence 6P) and 3D glasses which have the corresponding frequency filters for each eye. This is a very efficient 3D system (around 45%) compared to the very best of the rest (around 27%). There was noticeable green color fringing at the edges of the glasses, however, which, I was assured, would be fixed in the very, very near future. Notwithstanding this, the image was of a size and quality not seen before on a screen of this size. Added to that the system was capable of projecting higher frame rates than film, as high as 120 fps (in 3D at 2k resolution) as we witnessed with the Trumbull demonstration. This is the future. I don’t think anyone was left in any doubt about that. 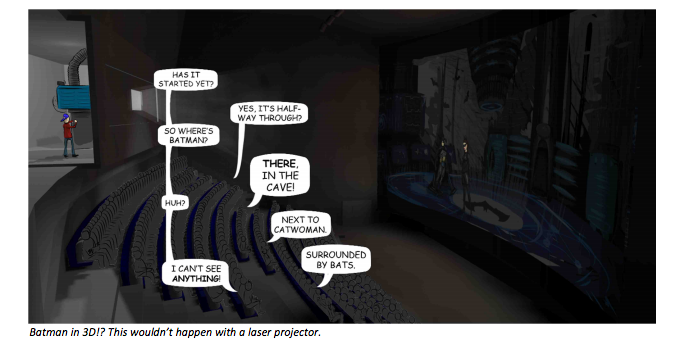 A small footnote though—if you’re considering buying a 3D system for your giant screen, don’t buy lumens (what’s in the projector), buy foot-lamberts (how bright the image will be)! There can be a big difference. Caveat emptor! As my colleagues on the technical committee keep reminding me, audio is important too (and they’re right). And it was proved with an impressive demonstration of Dolby Atmos and Christie’s relatively new VIVE speakers. With an array of five channels behind the screen, 10 or so on either side, two rows of 10 or so along the ceiling and a further group along the back wall, this gorgeous theater (screen number 1 at the Cineplex Cinema, Queensway) was not left wanting for speakers. The Atmos system allows the sound to be targeted to any of the VIVE ribbon driver arrays to deliver an extremely accurate and highly controlled powerful system. Phil Streather (CEO at Principal Large Format) earned his stripes during this session. He managed to explain the complicated subject of “3D for the Giant Screen” without using any of his PowerPoint slides (possibly due to the combination of Microsoft and Apple products being used for this temporary set-up. Yet another Apple hitch this month? Surely not). What did help him greatly were the fantastic shots and demo reel put together by himself and Rik Tester of Onsight (a London-based post-production specialist). This Streather/Tester combo produced a series of stunning 3D sequences that came to life on the giant screen. Phil’s point was that to avoid making the audiences’ eyes hurt when watching 3D on the giant screen, it’s important to have control over the inter-axial distance of the cameras (the horizontal separation between the two lenses of a 3D camera rig). A few feet apart for long distance shorts, an inch or less for extreme close ups. They even showed an amazing 2D-to-3D conversion created in post. I couldn’t see the join. They know their stuff, clever boys. Another clever boy, in the form of James Cameron, treated us to a thorough demonstration of why higher frame rates overcome the image judder that one experiences in 3D. I should make it clear that Mr. Cameron didn’t join us for the day, but he did at least allow us to show this impressive 25-minute 3D piece (or more likely one of his staff did). 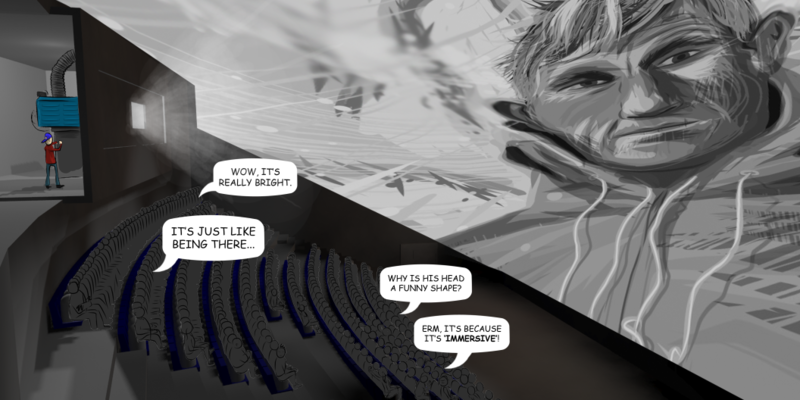 We had tried in the past, but because we use giant screens, we couldn’t achieve the 10fL 3D brightness that they demanded. This demo was only achievable using this laser system on this size screen. 3D projection (and television) uses the principle that our eyes see a slightly different perspective of the same object. 3D systems present this different perspective to each eye. We particularly notice the edges of an object to derive this perspective and 3D depth. Cameron’s demo showed that at normal frame rates (24 fps) when panning across a scene, for instance, the edges of an image jump across the screen in steps rather than a nice smooth motion. This “steppyness” is difficult to follow and, therefore, determine the 3D image. It results in noticeable image judder and break up. Run the images at 48fps or even 60fps and everything smooths out. The 3D is clear and far sharper (although too clear and too sharp for some!). Another of the ‘wow’ moments of the day for me was a dance sequence shot at 240fps, then projected at 60fps, resulting in a slow-motion visual delight that was smooth and flowing, with every detail crystal clear. Everything from the dancers’ hair to the flowing lace of the dresses shone bright and clear and looked extremely natural. I can foresee that this technique will be woven among the many other proven filming techniques and presented as part of a variable frame rate experience. One day. Short for “Bring Back Our Wide Shots,” this session was a call to action from the technical committee after seeing some of the films in production at our annual Film Expo in Austin earlier in the year. The opinion was that some producers may not be using the best camera for the job, particularly in aerial scenes and wide shots, where high resolution and detail are (or should be) noticeable. So two of our very best, James “sorry I missed the meeting, but I was training astronauts” Neihouse and Andrew Oran of FotoKem, set out on the challenge to compare the very latest digital cameras with conventional 15perf/65mm film—the reference for wide shot capture. 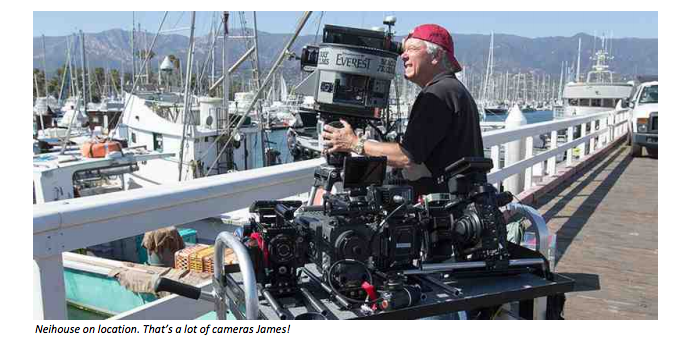 What followed was a series of on-location shots and a lot of hard work to create a very revealing side-by-side comparison of five digital cameras: the Sony F-65, RED Dragon, RED Epic, Arri Alexa XT (open gate), and the Canon C500. What was also impressive were the amount of questions, comments and observations from this very discerning audience. My, they are fussy. But there’s nowhere to hide on the giant screen, especially on the wide shots. And the winner was? Film, of course (for capture, at least). Next up? Let’s see what the astronauts on the International Space Station think. A pair of C500’s were launched a few days before the conference and will spend a year in space capturing probably the widest wide-shot there is! The same answer was given at this GSCA event too. The images were indeed colorful but nonetheless reigned in. What a missed opportunity, I say. Thankfully, practically the entire giant screen industry were represented in the theater that day. Between us we could define our own standards for color space. We already have laid out our own theater standards called DIGSS (Digital Immersive Giant Screen Specifications). I, for one, would like to explore the possibility of setting our own specifications for giant screen color space so that we can set a new bar called DIGSS-P11 (I just made that up). Earlier this year the GSCA technical committee set about to further demystify all the processes and techniques necessary, from camera lens to screen, to achieve the best possible images (and sounds) on screen. The result was a taskforce, led by Christian Fry of Pretend Entertainment, entitled Production & Post-Production Workflow, or P3-W for short. This initiative led to a well-attended, what-you-get-is- what’s-on-the-tin workshop entitled “Mastering the Giant Screen Workflow.” Fry and the award winning Daniel Ferguson led the session, very ably supported by Matt Scott (Editorial Supervisor on Island of Lemurs and IMAX Specialist at the University of Southern California School of Cinematic Arts), Alexis Cadorette-Vigneau (Post Production Supervisor on Jerusalem) and Myles Connolly (Producer, 360-Media, Supervising Producer on Flight of the Butterflies). These guys shared their extensive experience of the practicalities of shooting and editing for the giant screen. A simple example was that camera crews brought up on cinema have to keep being reminded to “point the camera up” so that the action appears low in the frame. It was also pleasing to hear how much thought goes into ensuring that the film is suitable for dome distribution too. Technology, don’t ya love it! This year’s tech session was a real tech-fest. Stacked full of the latest hardware, great media, clips and super-smart tech-heads. However, it wasn’t without its glitches. The most troublesome was the most simple task of showing PowerPoint slides, and like all things, it worked perfectly in rehearsals. However, considering that the system was only installed the day before, I’d say the team did a brilliant job of pulling it all together. I do have some insight into what went on behind the scenes to make this happen. A month or so out I thought we’d have to cancel. So we really have to thank everyone involved for showing everything that we had on our wish list. Well done. One thing we did learn: iPhones are great at many things, but as a remote slide changer though? I’m not so sure. Earlier in the year the GSCA commissioned a thorough market survey, targeted at audiences, to determine what they think of, and what they want from giant screens (in the institutional market). The comprehensive results were presented at the conference and, in short, revealed that audiences aren’t seeking something dramatically different. What came out as a top priority though was quality. It’s clearly something that they have come to expect from the giant screen format. As filmmakers and theaters transition over to digital, we need to ensure that quality doesn’t dip to an unacceptable level before it gets even better. How can one sum up this event without using tired clichés? 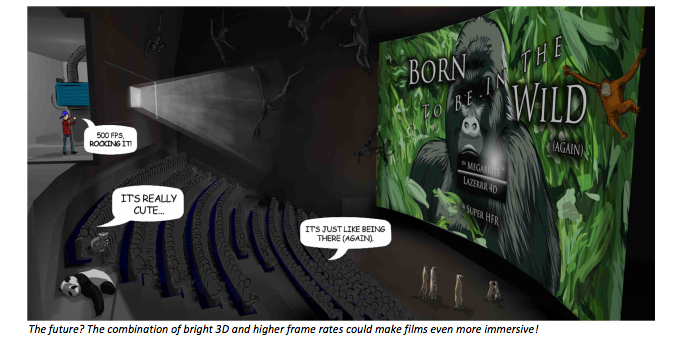 Yes, “the future is bright.” At least 14fL of brightness in fact (in 2D & 3D no less). And “the future is now.” We saw it. Laser projectors and 120 fps on a giant screen. And distressingly realistic CG robots. What could be more futuristic?! And “we are at a crossroads.” We witnessed the great film wow moments alongside great digital ones too on a great digital system. What was most satisfying about this conference was that we all witnessed these together and, I would say, all came away very upbeat and with a positive feeling about the industry. Time to set sail then…. Note: Martin Howe is a member of the board of GSCA and co-chair of the GSCA technical committee. The comments in this article are his alone and do not reflect the opinions of the GSCA.